The California Articles of Incorporation of a Nonprofit Public Benefit Corporation | ARTS-PB 501(c)(3) must be filed with the California Secretary of State before a nonprofit public benefit corporation may operate in this state. This will require a filing fee of $30.00 if submitting by mail or a filing fee of $30 plus a service fee of $15.00 (total payment of $45.00) if submitting in person. There is an option available to receive a certified copy of the articles you have submitted with the Secretary of State for an additional $5.00 fee. It should be noted that additional paperwork will be required with entities such as the I.R.S and the California Tax Franchise Board. Also, within 90 days after filing the articles, the newly formed nonprofit public benefit corporation must submit the SI-100 or Statement of Information (this will require a $25.00 fee) either online or by mail. 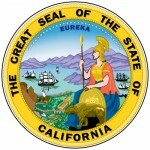 The California Articles of Incorporation may only be filed by mail or in person. Electronic filing is not available when forming a corporation. You may file by mail by mailing all relevant documents, payments, and attached provisions/information to Secretary of State Business Entities, P.O. Box 944260 Sacramento, CA 94244-2600. If desired you may submit in person at by bringing the submittal package to Secretary of State 1500 11th Street, 3rd Floor Sacramento, CA 95814. Step 1 - In the “Corporate Name” section, report the name of the forming entity. This must be a unique name that is available. Step 2 - In the “Corporate Purpose” section, locate Item 2a. Here you must indicate if the purpose of the forming nonprofit Public Benefit Corporation is to operate for public purposes or charitable purposes. You may indicate this by either placing a check mark in the box labeled “Public Purposes” or placing a check mark in the box labeled “Charitable Purposes.” Then in Item 2b, if there is a specific purpose behind forming this entity, report it in the space provided. Step 3 - In section 3, “Service of Process,” you must report who has been appointed to receive court documents and other legal paperwork on behalf of the public benefit corporation these articles are forming in the event this entity is sued. Locate Item 3a, then report the identity of this entity on the space provided. In Item 3b, enter the address of this corporate agent, if and only if he/she/it has not previously been named as a corporate agent for other entities. Step 4 - In “Corporate Addresses,” you must list the Physical Address where this corporation will be operating (Street Address, City, State, Zip Code) in Item 4a. It this entity has a separate Mailing Address, you may document in the space provided in Item 4b. Step 5 - Item 5, will make required statements for obtaining tax exempt status (though you must still contact the I.R.S separately). Read this section as the forming entity must adhere to the statements it makes. 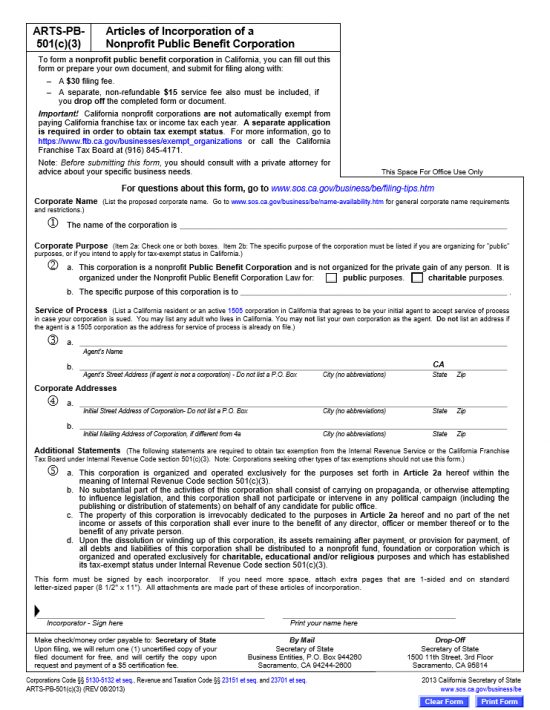 Step 6 - The bottom of this form will require an Incorporator’s signature and printed name. If other parties are incorporating this entity they must sign and print their names on a separate sheet of paper and attach it to this form. Step 7 - When it is time to file your information, gather all required documents, the original and completed Articles of Incorporation of a Nonprofit Public Benefit Corporation | Form ARTS-PB501(c)(3). and payment then submit it to the California Secretary of State by either mail ($30.00) or in person ($45.00). If you wish a certified copy of you articles one is available for an additional fee of $5.00.